Updated: Oct. 15, 2018 at 11:50 p.m.
Dak Prescott led the Cowboys to a victory in Jerry's World, the Ravens shutout the Titans, and the Patriots handed the Chiefs their first loss of the season. Take a look at the best shots from Week 6. 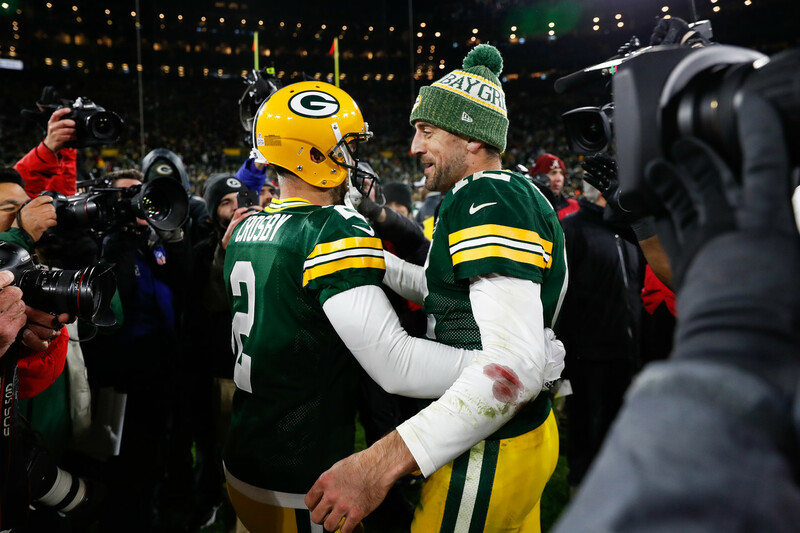 Green Bay Packers kicker Mason Crosby (2) hugs quarterback Aaron Rodgers (12) after kicking the winning field goal following an NFL football game against the San Francisco 49ers on Monday, Oct. 15, 2018, in Green Bay, Wis. Green Bay won 33-30. Green Bay Packers kicker Mason Crosby (2) celebrates with teammates after kicking the winning field goal during an NFL football game against the San Francisco 49ers on Monday, Oct. 15, 2018, in Green Bay, Wis.
Green Bay Packers linebacker Clay Matthews (52) celebrates after a sack during an NFL football game against the San Francisco 49ers on Monday, Oct. 15, 2018, in Green Bay, Wis.
San Francisco 49ers defensive tackle DeForest Buckner (99) celebrates after a sack during an NFL football game against the Green Bay Packers on Monday, Oct. 15, 2018, in Green Bay, Wis.
Green Bay Packers wide receiver Marquez Valdes-Scantling (83) makes a catch against San Francisco 49ers strong safety Jaquiski Tartt (29) during the second half of an NFL football game Monday, Oct. 15, 2018, in Green Bay, Wis.
Green Bay Packers quarterback Aaron Rodgers (12) straight arms San Francisco 49ers linebacker Malcolm Smith (51) during the first half of an NFL football game Monday, Oct. 15, 2018, in Green Bay, Wis.
Green Bay Packers kicker Mason Crosby (2) celebrates after kicking a field goal during an NFL football game against the San Francisco 49ers on Monday, Oct. 15, 2018, in Green Bay, Wis.
San Francisco 49ers wide receiver Marquise Goodwin (11) dives for a touchdown in front of Green Bay Packers cornerback Tramon Williams (38) during an NFL football game on Monday, Oct. 15, 2018, in Green Bay, Wis.
Green Bay Packers tight end Jimmy Graham (80) and San Francisco 49ers cornerback Richard Sherman (25) joke around prior to an NFL football game on Monday, Oct. 15, 2018, in Green Bay, Wis.
Miami Dolphins cornerback Xavien Howard (25), center, cornerback Cordrea Tankersley (23), left, and running back Kenyan Drake (32), right, celebrate during a NFL football game against, Sunday, Oct. 14, 2018, in Miami Gardens, Fla.
Dallas Cowboys quarterback Dak Prescott (4) celebrates during an NFL regular season football game against the Jacksonville Jaguars on Sunday, Oct. 14, 2018 in Arlington, TX. Kansas City Chiefs wide receiver Tyreek Hill (10) runs into the end zone for a touchdown against the New England Patriots during an NFL football game on Sunday, October 14, 2018 in Foxborough, Mass. Baltimore Ravens wide receiver Michael Crabtree (15) celebrates his touchdown during an NFL football game against the Tennessee Titans on Sunday, Oct. 14, 2018, in Nashville. Seattle Seahawks wide receiver Jaron Brown (18) does a touchdown dance with wide receiver David Moore (83) after Brown scored during an NFL football game against the Oakland Raiders at Wembley stadium in London, on Sunday, Oct. 14, 2018. Seattle Seahawks won the match 27-3. New England Patriots quarterback Tom Brady (12) celebrates during an NFL football game against the Kansas City Chiefs on Sunday, October 14, 2018, in Foxborough, Mass. Dallas Cowboys quarterback Dak Prescott (4) runs into the end zone for a touchdown in the first half of an NFL football game against the Jacksonville Jaguars in Arlington, Texas, Sunday, Oct. 14, 2018. Seattle Seahawks running back Mike Davis (27), left, escapes the clutches of Oakland Raiders linebacker Tahir Whitehead (59) during the first half of an NFL football game at Wembley stadium in London, Sunday, Oct. 14, 2018. Cincinnati Bengals wide receiver Tyler Boyd (83) catches a touchdown pass in the first half of an NFL football game against the Pittsburgh Steelers, Sunday, Oct. 14, 2018, in Cincinnati. Tampa Bay Buccaneers quarterback Jameis Winston (3) slides to the turf against Atlanta Falcons strong safety Damontae Kazee (27) during the first half of an NFL football game, Sunday, Oct. 14, 2018, in Atlanta. Pittsburgh Steelers wide receiver Antonio Brown celebrates his touchdown in the second half of an NFL football game against the Cincinnati Bengals, Sunday, Oct. 14, 2018, in Cincinnati. Cincinnati Bengals running back Joe Mixon, right, celebrates with quarterback Andy Dalton, center, after scoring a touchdown in the second half of an NFL football game against the Pittsburgh Steelers, Sunday, Oct. 14, 2018, in Cincinnati. Baltimore Ravens wide receiver Michael Crabtree (15) catches a touchdown pass as he is defended by Tennessee Titans cornerback Malcolm Butler in the first half of an NFL football game Sunday, Oct. 14, 2018, in Nashville, Tenn.
Los Angeles Rams running back Todd Gurley (30) scores a touchdown as Denver Broncos linebacker Todd Davis (51) defends during the first half of an NFL football game, Sunday, Oct. 14, 2018, in Denver. Baltimore Ravens running back Alex Collins (34) scores a touchdown against the Tennessee Titans in the first half of an NFL football game Sunday, Oct. 14, 2018, in Nashville, Tenn.
Pittsburgh Steelers running back James Conner (30) runs the ball in the first half of an NFL football game against the Cincinnati Bengals, Sunday, Oct. 14, 2018, in Cincinnati. Chicago Bears quarterback Mitchell Trubisky (10) celebrates during a NFL football game against the Miami Dolphins, Sunday, Oct. 14, 2018, in Miami Gardens, Fla.
Seattle Seahawks wide receiver Tyler Lockett (16) celebrates a touchdown during an NFL football game against the Oakland Raiders, Sunday, Oct. 14, 2018 in London. Miami Dolphins tight end Mike Gesicki (86) leaps over Chicago Bears defensive back Kyle Fuller (23) during a NFL football game, Sunday, Oct. 14, 2018 in Miami Gardens, Fla.
Oakland Raiders wide receiver Dwayne Harris (17) runs the ball as Seattle Seahawks cornerback Shaquill Griffin (26) defends during an NFL football game, Sunday, Oct. 14, 2018 in London. Washington Redskins wide receiver Paul Richardson (10) celebrates his touchdown during the first half of an NFL football game against the Carolina Panthers, Sunday, Oct. 14, 2018 in Landover, Md. Seattle Seahawks wide receiver David Moore (83) catches the ball for a touchdown during the first half of an NFL football game at Wembley Stadium in London, Sunday, Oct. 14, 2018. Oakland Raiders running back Marshawn Lynch (24) runs the ball during an NFL football game against the Seattle Seahawks, Sunday, Oct. 14, 2018 in London. Pittsburgh Steelers running back James Conner (30) runs the ball against Cincinnati Bengals linebacker Preston Brown (52) in the first half of an NFL football game, Sunday, Oct. 14, 2018, in Cincinnati. Arizona Cardinals tight end Ricky Seals-Jones, right, catches a pass over Minnesota Vikings free safety Harrison Smith (22) during the first half of an NFL football game, Sunday, Oct. 14, 2018, in Minneapolis. New York Jets wide receiver Terrelle Pryor (16) celebrates after catching a touchdown pass from quarterback Sam Darnold, not pictured, during the first half of an NFL football game against the Indianapolis Colts, Sunday, Oct. 14, 2018, in East Rutherford, N.J.
New York Jets inside linebacker Avery Williamson (54) runs off the field with defensive end Leonard Williams (92) after intercepting a pass from Indianapolis Colts quarterback Andrew Luck, not pictured, during the first half of an NFL football game, Sunday, Oct. 14, 2018, in East Rutherford, N.J.
Tampa Bay Buccaneers quarterback Jameis Winston (3) moves past Atlanta Falcons strong safety Damontae Kazee (27) during the first half of an NFL football game, Sunday, Oct. 14, 2018, in Atlanta. Tampa Bay Buccaneers tight end O.J. Howard (80) celebrates his touchdown against the Atlanta Falcons during the first half of an NFL football game, Sunday, Oct. 14, 2018, in Atlanta. Cincinnati Bengals wide receiver Tyler Boyd celebrates after scoring a touchdown in the first half of an NFL football game against the Pittsburgh Steelers, Sunday, Oct. 14, 2018, in Cincinnati. Houston Texans defensive end J.J. Watt (99) celebrates after he sacked Buffalo Bills quarterback Josh Allen during the first half of an NFL football game, Sunday, Oct. 14, 2018, in Houston. Cincinnati Bengals wide receiver Tyler Boyd (83) runs the ball past Pittsburgh Steelers defensive back Marcus Allen (27) in the first half of an NFL football game, Sunday, Oct. 14, 2018, in Cincinnati. Seattle Seahawks quarterback Russell Wilson (3) gets away from Oakland Raiders linebacker Derrick Johnson (56) during the first half of an NFL football game at Wembley Stadium in London, Sunday, Oct. 14, 2018. Houston Texans wide receiver DeAndre Hopkins (10) is hit by Buffalo Bills linebacker Matt Milano (58) during the first half of an NFL football game, Sunday, Oct. 14, 2018, in Houston. Chicago Bears tight end Trey Burton (80) jumps for a touchdown as Miami Dolphins linebacker Kiko Alonso (47) is late with the tackle, during the second half of an NFL football game, Sunday, Oct. 14, 2018, in Miami Gardens, Fla.
Cleveland Browns tight end David Njoku (85) leaps to a avoid a tackle in the first half during an NFL football game against the Los Angeles Chargers, Sunday, Oct. 14, 2018, in Cleveland. Houston Texans quarterback Deshaun Watson (4) during the first half of an NFL football game against the Buffalo Bills, Sunday, Oct. 14, 2018, in Houston. Washington Redskins cornerback Josh Norman (24) carries the ball after pulling in an interception as Carolina Panthers running back Christian McCaffrey (22) pursues him during the first half of an NFL football game, Sunday, Oct. 14, 2018, in Landover, Md. New England Patriots defensive back Duron Harmon (21), right, celebrates with defensive back Devin McCourty (32) during an NFL football game against the Kansas City Chiefs on Sunday, October 14, 2018 in Foxborough, Mass. Atlanta Falcons wide receiver Mohamed Sanu (12) makes a touchdown catch against the Tampa Bay Buccaneers during the first half of an NFL football game, Sunday, Oct. 14, 2018, in Atlanta. Miami Dolphins tight end Nick O'Leary (83) runs for a touchdown as Chicago Bears free safety Eddie Jackson (39) is late with the tackle, during the first half of an NFL football game, Sunday, Oct. 14, 2018, in Miami Gardens, Fla.
Dallas Cowboys players huddle together before an NFL regular season football game against the Jacksonville Jaguars on Sunday, Oct. 14, 2018 in Arlington, TX. Washington Redskins tight end Vernon Davis (85) pulls in a touchdown pass during the first half of an NFL football game against the Carolina Panthers, Sunday, Oct. 14, 2018, in Landover, Md. Indianapolis Colts wide receiver Marcus Johnson (16) celebrates after scoring on a touchdown pass from quarterback Andrew Luck, not pictured, against the New York Jets during the first half of an NFL football game, Sunday, Oct. 14, 2018, in East Rutherford, N.J.
Washington Redskins tight end Vernon Davis (85) celebrates with fans after this touchdown catch during the first half of an NFL football game against the Carolina Panthers, Sunday, Oct. 14, 2018, in Landover, Md. Philadelphia Eagles defensive end Michael Bennett (77) strips the ball from New York Giants quarterback Eli Manning (10) during the first half of an NFL football game Thursday, Oct. 11, 2018, in East Rutherford, N.J.
Philadelphia Eagles wide receiver Alshon Jeffery (17) catches a pass for a touchdown during the first half of an NFL football game against the New York Giants Thursday, Oct. 11, 2018, in East Rutherford, N.J.
New York Giants' Saquon Barkley (26) hurdles Philadelphia Eagles' Malcolm Jenkins (27) during the first half of an NFL football game Thursday, Oct. 11, 2018, in East Rutherford, N.J.
New England Patriots quarterback Tom Brady, left, congratulates running back Sony Michel on his touchdown against the Kansas City Chiefs during the first half of an NFL football game, Sunday, Oct. 14, 2018, in Foxborough, Mass. Hall of Fame linebacker Robert Brazile celebrates as he is added to the Tennessee Titans ring of honor before an NFL football game between the Titans and the Baltimore Ravens Sunday, Oct. 14, 2018, in Nashville, Tenn. At left is Hall of Fame president David Baker. Tennessee Titans defensive back Logan Ryan (26) celebrates during an NFL football game against the Baltimore Ravens Sunday, Oct. 14, 2018, in Nashville, Tenn.
Dallas Cowboys running back Ezekiel Elliott (21) and quarterback Dak Prescott (4) celebrate during an NFL football game against the Jacksonville Jaguars on Sunday, Oct. 14, 2018 in Arlington, TX. San Francisco 49ers cornerback D.J. Reed (32) fumbles the ball on a kickoff and the Green Bay Packers recover during an NFL football game on Monday, Oct. 15, 2018, in Green Bay, Wis.